Yahoo earlier this year announced plans to phase out Google- and Facebook-based sign-in from its services. The feature was initially removed from a sports service and now it is Flickr’s turn, after Yahoo emailed users of the photo site with notice that Google and Facebook IDs will no longer be accepted there after June 30. 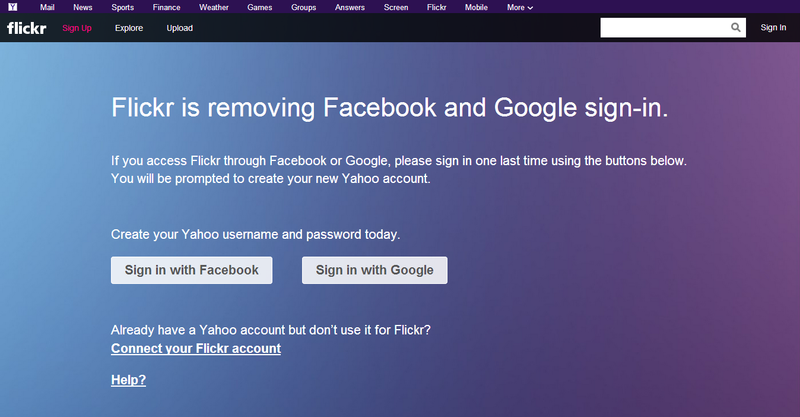 Instead, Flickr users must create a Yahoo account and connect it to the photo storage site. Those with an existing Yahoo ID which is not connected to Flickr are encouraged to link it up before the end of this month. Flickr integrated these third-party log-ins three years ago in a bid to widen user numbers, but current Yahoo CEO Marissa Mayer seems keen to use the popularity of Flickr to help boost Yahoo’s own userbase. Beyond providing email, a Yahoo account can be used to create a personalized experience on Yahoo internet portals, which list content like sports, weather and general news, and mobile apps like Yahoo News Digest, the two-time Apple Design Awards winner. We’ve asked Yahoo for its timeline of removing Google and Facebook ID sign-in from other services is, and will update this post with any new information provided.